This is Part 3 of our Roadtrip ( you can go here to see Part 1 – and here to see Part 2). 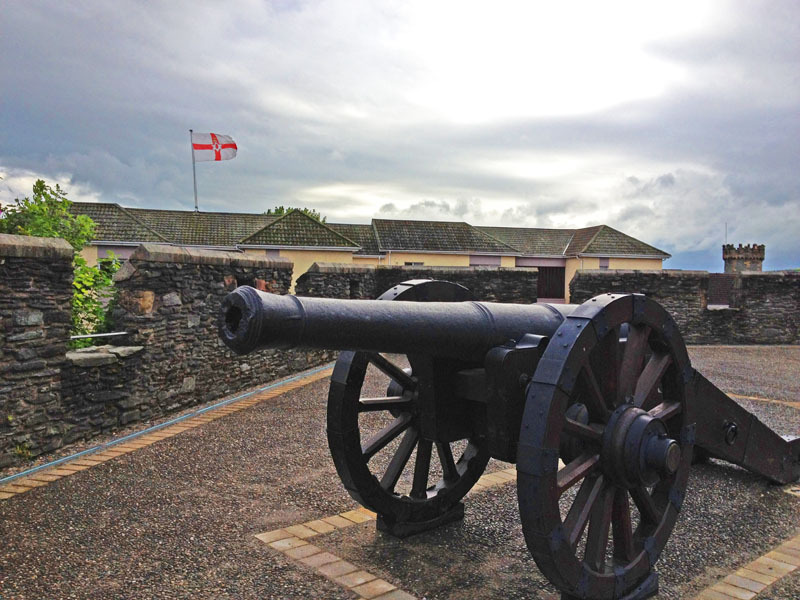 This week on our road trip around Ireland, we move to the counties of Derry, Antrim and Tyrone. As before, we’ll stick with the stories of the counties – the names and families associated with each. First, lets get something out of the way – why am I calling this County “Derry” as opposed to “Londonderry”? Well, simply because that’s the way I was brought up in the Republic of Ireland. History has evolved to this point that people of a Nationalist tradition in the North and South will always call it Derry – and those of a Unionist tradition will always call it “Londonderry”. For those of you whose ancestors came from this county – or left on ships from the port, you will always see “Londonderry” on documents. That was the official name. Today, however, if you visit the city of Derry – the authorities are at pains to call it Derry/Londonderry. And what a city! Have you visited? It has an intact walled town on the banks of the River Foyle. It’s a city of music, culture – and very,very friendly people. We ended up staying for 3 nights! The place name Derry is from the old Irish “Daire“ meaning “oak-grove”. It was once part of the area known as Tír Eoghain (Eoghan’s land) after one of the sons of the Niall of the Nine Hostages. The land here was in the hands of the O’Cahans (Kanes) until the 1600s. This area – along with most of Ulster – was the most strongly Gaelic area of Ireland until the 17th century. The Normans never really made an impact here. But with the overthrow of the Earls (O’Neill and O’Donnell) – the plantation of the lands started in earnest with English and Scottish planters. In 1610, the livery companies of the city of London agreed to plant the area, and in 1610 the county of “Londonderry” was established. The native Gaels were moved on (in theory) – new towns were established and an influx of English and Scottish settlers began. The thing is though – many of the planters realised the benefit of leaving the native Gaels to work on their land (although often illegal) – so many Gaelic names stayed in the places where their forefathers had been for a thousand years before. Baird, Boyd, Braden, Breen, Cowan, Crilly, Crow, Cunningham, Doherty, Duddy, Elliot, Friel, Haggerty, Irwin, Johnston, Lyttle, McCloskey, McEldowney, McElvaney, McKinnon, McLaughlin, McMillan, McQueary, Moody, O’Donnell, Reily, Stewart, Thompson, Toughill, Warke and Young. 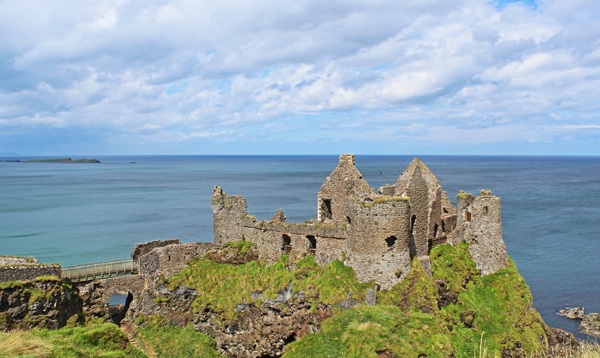 We drove along the north coast leaving Derry behind and moved into County Antrim – heading for the Giants Causeway. People often ask “Do you see a difference between the North and the Republic?” – and I must admit, one of the differences I always notice is the sense of neatness in the North (a bit like what you will see in the “home counties” of England). You definitely feel like you are somewhere else. And then … we drive through a town with Union Jack flags flying from every pole and house – and the pavement curbs painted in blue, white and red – you definitely know you are in a town or village with a unionist majority. County Antrim is named after its former county town, Antrim. The counties of Antrim and Down (east of the River Bann) were settled by Scottish planters long before the plantations began in earnest in other parts. This is a place where the Presbyterian Church in Ireland has the largest religious denomination. 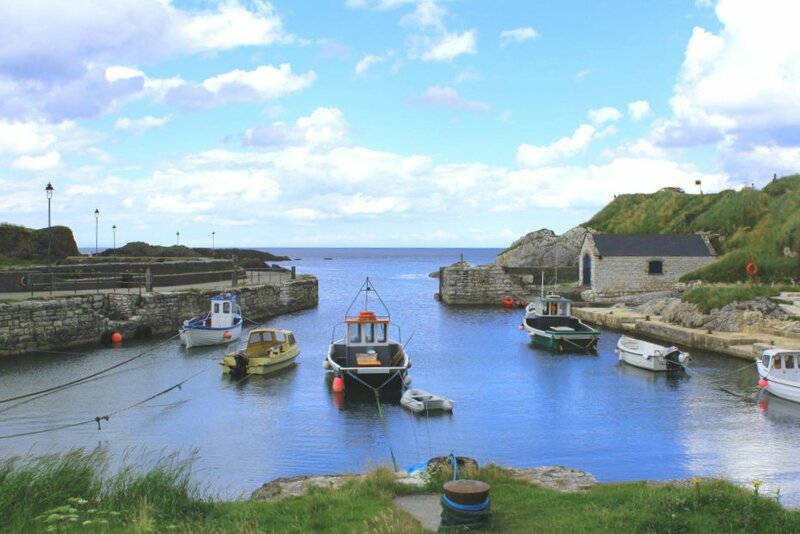 In the early Middle Ages, southern County Antrim was part of the Kingdom of Ulidia (which gave Ulster it’s name) and was ruled by the clans of Keenan and Donlevy – the north was part of Dál Riada, which stretched into western Scotland. A branch of the O’Neills of Tyrone migrated to south Antrim in the 14th century, and ruled it for a time. Their family was called “O’Neill Clannaboy”. A Gallowglass sept, the MacDonnells, were the most powerful in north Antrim. Adams, Allen, Allingham, Armour, Barnard, Barnett, Black, Blair, Boyd, Brown, Brownley, Campbell, Close, Craig, Crawford, Crossett, Crowe, Curistan, Devlin, Dixon, Duffy, Entrikin, Fosters, Gibson, Gilmore, Gilpin, Griggs, Haney, Hamilton, Harland, Hawthorne, Hull, Hurson, Irvine, Jamieson, Johnston, Kell, Kernahan, Knox, Larkin, Lavery, Leighton, Lucas, Lynn, Mackle, McAteer, McAuley, McBride, McCaffery, McCaugherty, McClements, McCluskey, McConaghie, McConnell, McConway, McCormick, McCracken, McCurdy, McDonald, McDonnell, McDuff, McFarlane, McGee, McIlwee, McKay, McKeown, McNair, McQuillan, McSpadden, Meechan, Molyneux, Moore, Noble, O’Hara, O’Neill, Patterson, Perry, Savage, Scally, Scott, Simpson, Strawbridge, Telford, Thompson, Todd, Traynor, Trimble, Wales and Wilson. 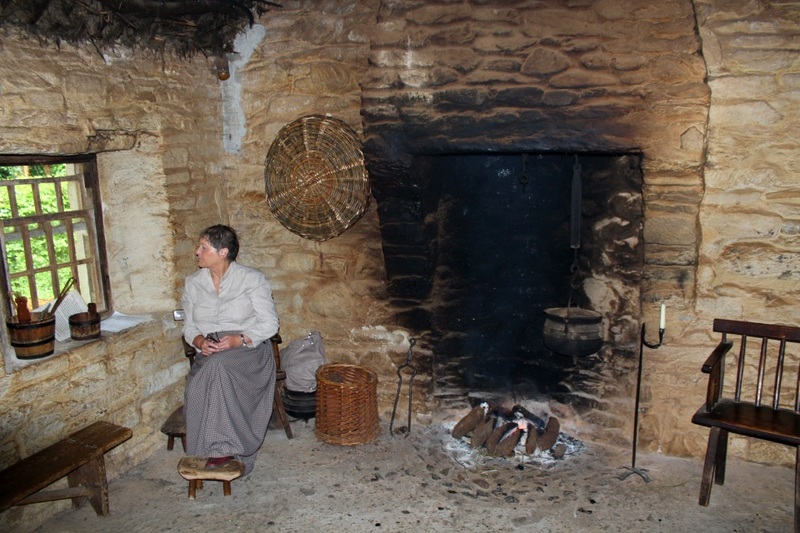 One of the first things we did when we came to Tyrone was visit the “Ulster American Folk Park” near Omagh. Have you been? In a way it represents an early history and prehistory of the United States. You quickly realise how much the Ulster Scots emigrants (many of whom came from this county) formed much of the attitude of the frontier – and the values that have become enshrined in the US constitution. 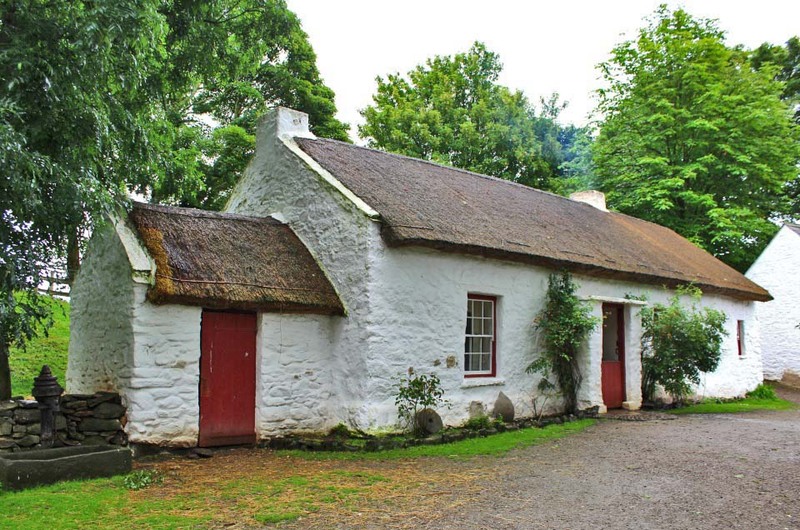 Mellon Homestead, Ulster American Folk Park, Omagh. These Ulster Scots firmly identified themselves as Irish (as opposed to Scottish) when they arrived in the colonies. Their families had been in Ireland for up to 6 generations. In the period up to 1780, it is estimated that 250,000 Ulster Scots left these parts of the US colonies. County Tyrone is the heartland of what was O’Neill country for more than a thousand years. 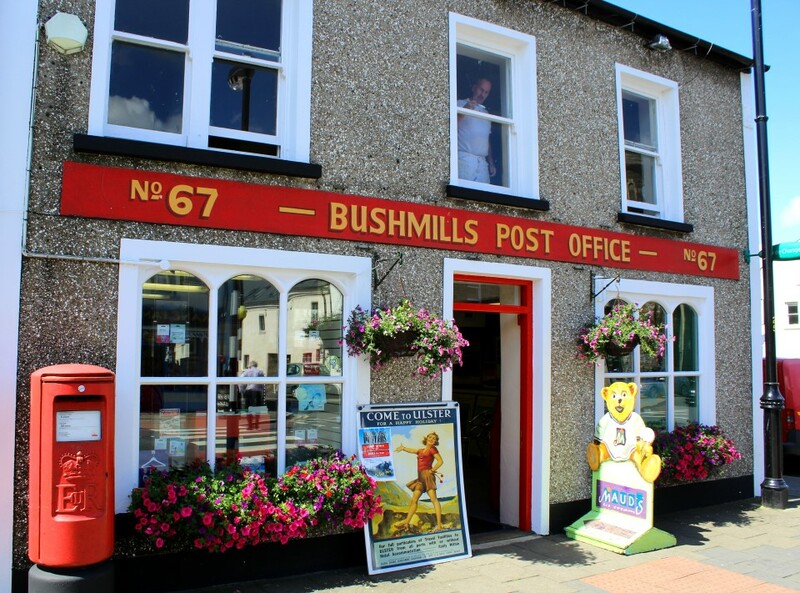 The county gets its name from the ancient division of the north-west of the country between the two sons of Niall of the Nine Hostages, Conall and Eoghan. 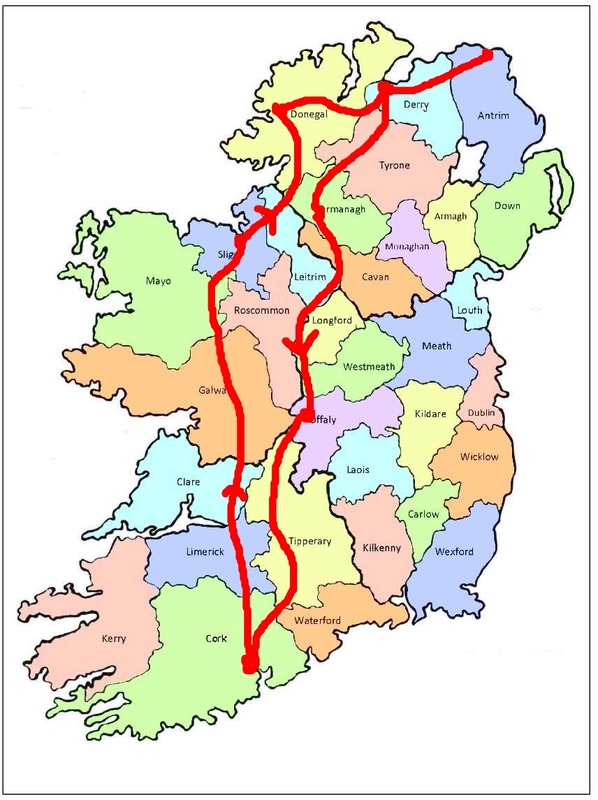 Most of what is now Donegal became Tír Conaill, Conall’s land, while the remainder went to Eoghan. Inside a County Tyrone Homestead. It was the defeat in 1603 of the rebellion led by Hugh O’Neill that marked the final collapse of the old Gaelic order. His lands were confiscated and the Plantation of Ulster began 10 years later. Barclay, Bradley, Calhoun, Carlin, Carlon, Carolin, Carson, Cochrane, Corr, Crawford, Devlin, Dungannon, Earley, Early, Ferguson, Findley, Galleen, Gibboney, Gibson, Gilchrist, Gorman, Greer, Hackett, Hamil,l Haston, Johnston, Kennedy, Lafferty, Lambert, Laverty, Logan, Loughran, Macklam, Mallon, Martin, McAleer, McCaffrey, McCarron, McCook, McCormick, McCusker, McElhatton, McGarrity, McGinley, McGlynn, McGrath, McGuckin, McGurren, McHugh, McKinney, McSorley, Mellon, Murray, Neville, Nickell, O’Brien, O’Neill, Paisley, Porneroy, Quinn, Scott, Sharkey, Shea, Shinners, Skivington, Snodgrass, Thompson, Wallace, Watters and Wilson. And that’s it for this week – next week we continue our road-trip back down south into County Cavan. See you then. DO remember to leave your comments and questions below. Was in Ireland in 2000 for the month of June. Visited Tyronne where we contacted McKinney family relatives of my Curran family. Absolutely beautiful country. Hope I make it back soon. Conaty family member. It is s lovely County alright Bettie – and often bypassed on the tourist trail. Mike. One of my lineages is the Allingham family from Ulster, the only Protestants in the family. What is the origin of the Allingham name? Were they part of the plantation? In c1800 they lived in Ulster, then in c.1820 they were in Ayrshire, Scotland where my g-g-g-grandmother Margery Allingham was born. She married Samuel Mulholland in Scotland and his family was also from Ulster. I’m wondering if those names are Irish or Scottish? Thanks. Hi Mary – my records show that while being English – the Allingham name has been in Donegal (Ballyshannon to be precise) since the early 1600s. Mike. Hi Diane – I think Dulin was originally a French Huguenot name that is quite rare in Ireland. Mike. My grandfather always said we were Irish from the Dublin area. My gggg grandfather was Thomas Crow came to America in the late 1700’s. Where are the Crow’s from & what clan?? Don’t see the McFarland name anywhere. Is it Irish or Scottish? I just joined your wonderful “Letter from Ireland”. I have been searching my Irish heritage on Ancestry and your letter is wonderful with stories! My family’s Name is McCullough and my grandfather was born in Loughbrickland, Down County and I believe also lived in Banbridge. They were flax workers and I don’t believe owned property. My great grandparents and grandparents came to Chicopee, Massachusetts and settled in 1888. Chicopee at the time had the largest cotton mill. We were told by an Aunt that we were Scottish and I have hit a brick wall to find the real story. Thank you for your beautiful letter i’s very informative!